Run and mantained by the Druids, The Library of Shadowmoor is one of the largest libraries in the land. Ancient tomes of arcane knoweldge, along with the most common novels and tales can be found on its shelves. At the moment you can find about 300 tomes on the library shelves. 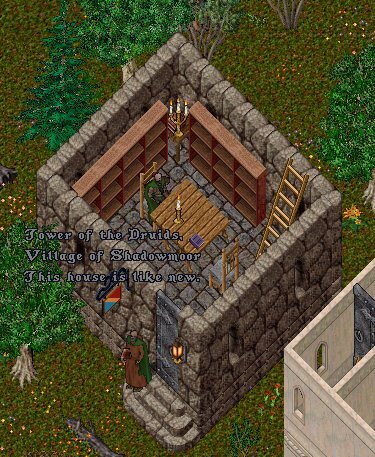 "When the guild moved to the land now known as Trammel and built the village of Shadowmoor, I felt that the time to make my private collection available to the public had arrived. This is the result of a lifetime of efforts: I traveled to the far towns and villages, met with the most strange and unexpected people, gathered the news and rumors and verified them with long quests. Now, with the help of my apprentice Darkwind and the rest of the Druids, the library is a realty, and I am proud of it." To the western side of Shadowmoor, a bit aside, lays the Druids Tower. It can be reached easily from the Yew Moongate: it is the first village building to the North-North-East of the moongate itself. This is the tower where the druids live and perform their arts. This is also the place where the library can be found. Upon entering the tower, youwill find the main library room. Here are kept most of the books. A reading table is also provided, along with a guide to the library itself. Using the guide you will easily find the bookshelf containing the books that are of interest to you. On the second floor, where the druids study is, more bookshelves can be found. Here are the books on magical research and the other arcane arts, along with those books that still are to be studied and archived. This is the place where the druids belongings are kept too. On the roof is the Gathering Place. Here the Druids perform some of their rituals. This floor is also used for their gatherings where they discuss things related to their activities. Often they can be found there simply chatting and having some fun of the rangers, anyways. The Druids circle is a relatively little group within the Shadow Rangers guild. Like the rangers, they are dedicated to the protection of the wildlands and their inhabitants. However, the druids are more mystic than their woodsmen counterparts and are usually well versed in the magical arts. In fact, they claim to gather their powers from the Nature itself. Another difference with the rangers is the fact that often the druids are more interested in achieving a balance between Good and Evil. It is not uncommon to see a druid ignoring a lone troll in the forest: it is considered not much worse than a predator. But if a given area of the forest is infested with monsters, rest assured that the druid will take care of the problem: the large number of evil creatures in the area wouldn't allow a good balance in the area. If you know about new books or wrote some yourself, please do nay hesitate to contact us (pigeon number: 4187305). We will gladly accept every new book.